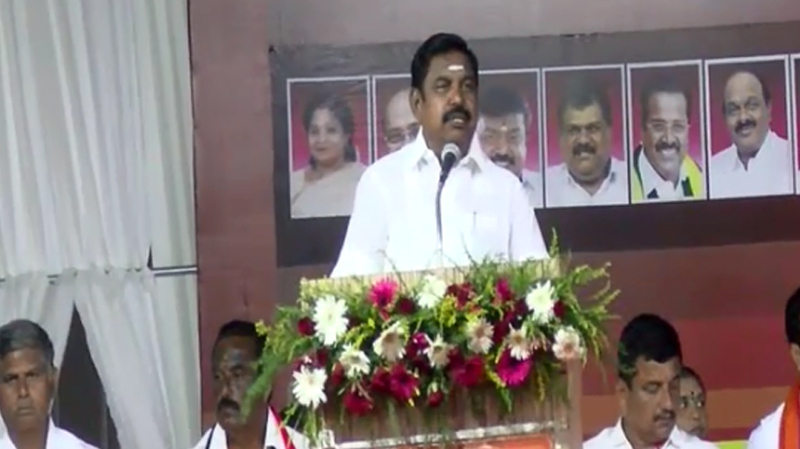 Coimbatore : Tamil Nadu Chief Minister Edapadi K Palanisamy Tuesday expressed confidence that the nation will re-elect Narendra Modi as the Prime Minister in the 17th Lok Sabha elections. Modi was identified as the prime ministerial candidates by all the alliance partners in NDA, while the opposition parties could not even agree on a candidate among themselves, Palanisamy said while addressing a rally seeking votes for candidates for five constituencies, in the presence of Modi. “The opposition is still searching for its PM candidate. Only DMK president Stalin is projecting Rahul Gandhi as the Prime ministerial candidate, he said. He was confident of winning all the 40 parliamentary constituencies and also the 18 assembly seats. Referring to the BJP manifesto, the Chief Minister said that with the interlinking of rivers, there will be Godavari-Cauvery linking, which will be a great boon to the delta farmers. Once the Defence corridor, sanctioned by NDA Government, started functioning, there would be large employment opportunities, he said adding that Tamil Nadu will prosper, if a capable Prime Minister like Modi rules at the Centre.